Born from 100% Malvasia grapes, this golden-hued delight was inspired by a book written in 1685 by renown author and scientist, Francesco Redi. Upon reading this praise of the “Malvagia di Montegonzi”, it ignited our 15-years quest to reconstruct this profound, ancient wine. After anlyzing every conceivable detail, our experts we pinpointed a process that closely mirrors historical winemaking concepts. The white grapes are not pressed, but are left to drain naturally. Then the must is the fermented under strict temperature control without the skins, and decanted twice. Next, the wine is briskly fermented for just 2 weeks in French Oak barrels, enough time to impart a very light flavor of vanilla and spice that the wine gently embraces. 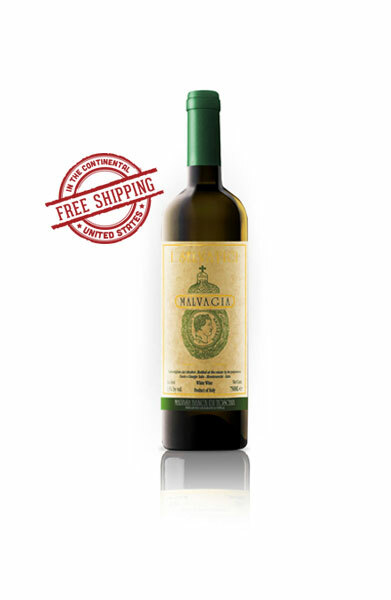 Finally, Malvasia Bianca is aged a scant six months in the bottle, preserving its freshness. All in all, we belive it to be the most delicious history lesson you’ll ever taste. Buyers can only purchase in multiples of 12, with a minimum order of 12 bottles. You are free to add as many bottles as you would like, and mix the wine varieties, as long as the total order is in multiples of 12. For example, buy 3 bottles of Vinsanto, 1 bottle of Cardisco and 8 bottles of Chianti Riserva for a total of 12 bottles. Currently we only ship to the United States (all States apart from Utah, Kentucky, Mississippi, New Hampshire, Vermont), shipping is FREE! To receive our wine in any other country in the World, please write to info@iselvatici.it. We’ll provide the exact prices for your delivery. – If you order 12 total bottles, no discount is applied. – If you order 24 total bottles they get a 15% discount on the cart total. – If you order 36 total bottles they get a 18% discount on the wines (15% on the Vinsanto). – If you order 48 total bottles they get a 22% discount on the wines (15% on the Vinsanto). – If you order 60 total bottles they get a 25% discount on the wines (15% on the Vinsanto).